Element: Elemente, bei denen die Common Accessibility Properties angewendet werden können. Abbreviations are difficult to interpret, if they are read by screen readers or other devices. The full form, the expansion text, should be added, so it can be read by devices, although it is not displayed as part of the text flow. As in HTML, alternative texts should be added to images and other elements such as links. Actual texts are replacement texts that can be added to be read by devices instead of the text, for example to ensure a better understanding. In the examples below, the registered trademark will be read as "trademark", and the list bullet symbol will be read as bullet. is a product developed by Compart AG. 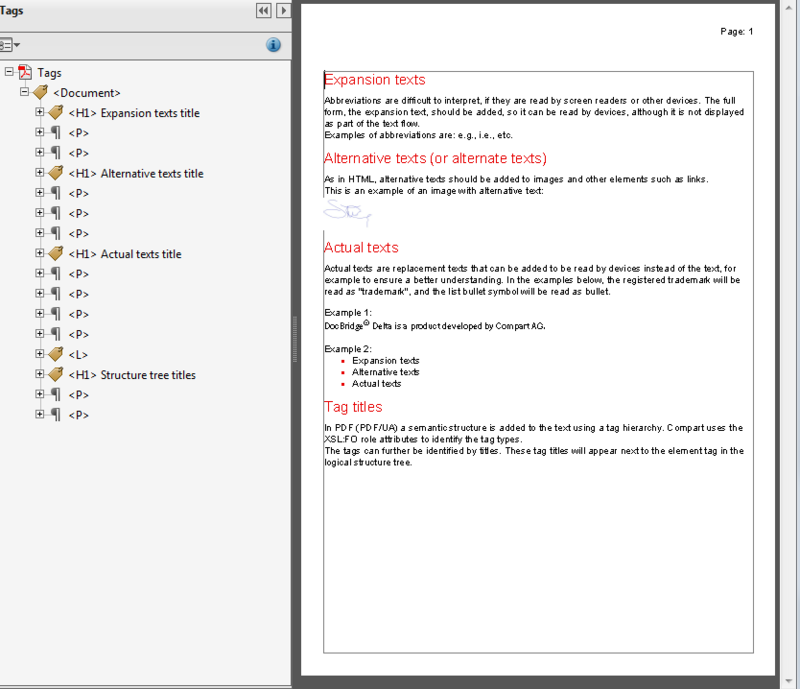 In PDF (PDF/UA) a semantic structure is added to the text using a tag hierarchy. Compart uses the XSL:FO role attributes to identify the tag types. The tags can further be identified by titles. These tag titles will appear next to the element tag in the logical structure tree.